CGA Engineers was selected for the surveying and civil engineering for the new United Keetoowah Band Office/Retail Center located in Tahlequah at the intersection of State Highway 51 and W. Keetoowah St. The total civil portion of the project included site development construction plans for the Office/Retail Center site and utility extensions necessary to support the center. The closest municipal sanitary sewer available to provide service to the site was approximately 1,400 feet from the site. The municipal line had to be extended to the site to provide sewerage for the new center. CGA Engineers coordinated the geotechnical exploration and reporting, performed the engineering survey, developed the sewer construction plans, and provided the engineering study and report for the Oklahoma Department of Environmental Quality (ODEQ) construction permit for the sewer extension. The newly constructed sewer extension will become the property of the City of Tahlequah and was designed to meet ODEQ regulations and the City of Tahlequah's construction standards. The municipal sewer extension was sized to service the total drainage basin that could flow to the sewer if it were fully developed. The total basin was determined to be 92 acres. 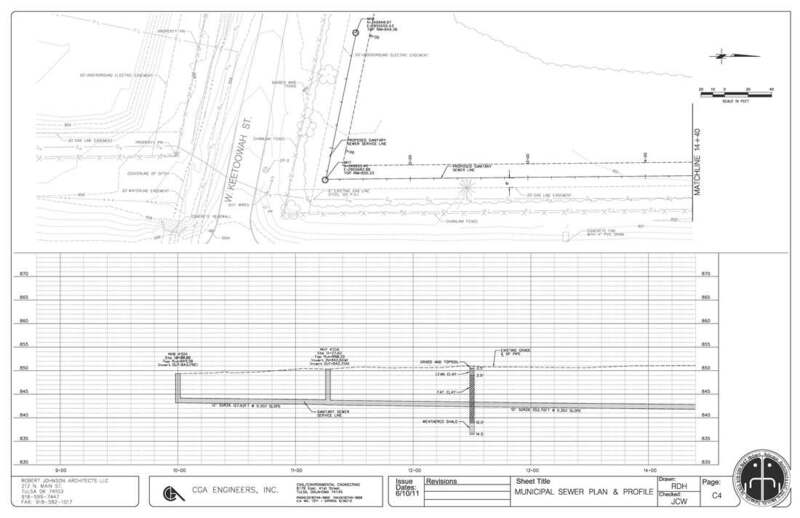 CGA Engineers executed a study to determine the flows that the new sewer may be required to handle in the future. Based upon fully developed flows and the City of Tahlequah's minimum construction stndards for sanitary sewers, a 12" line set at a 0.3 percent slope was selected for the new extension. The total length of the municipal extension is 1,400 feet.